Among the recommendations to fix Penfield Pavilion, badly damaged in Superstorm Sandy, is to elevate the building 14 feet. 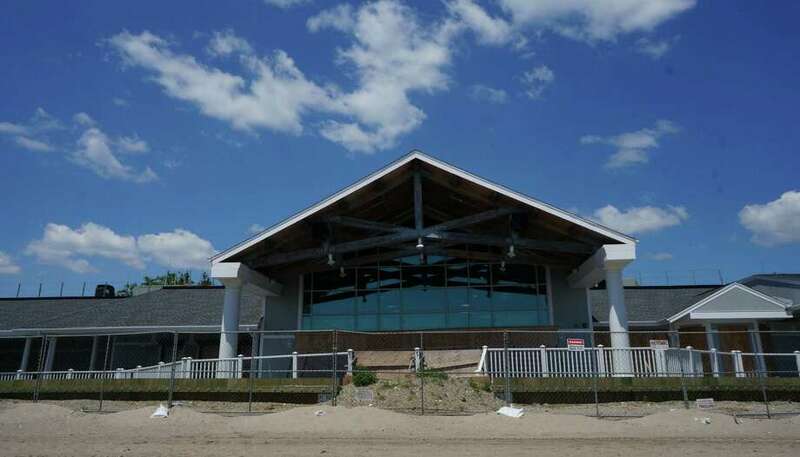 The town is considering two options to repair storm-damaged Penfield Pavilion, which has been closed since Hurricane Sandy ravaged the recently rebuilt structure. But Selectman Kevin Kiley wonders if a better plan night be to tear down the waterfront pavilion and start from scratch. The Board of Selectmen on Wednesday heard a report from structural engineers regarding what needs to be fixed at the pavilion. Sandy's surging tidal waters undermined pilings in the building's foundation, making it unsafe, and buckled floors and railings. The two repair options include elevating the structure in its current location, or elevating it and moving it farther back from the water into part of what is now the parking lot. No price tag has been attached to either scenario yet. Kiley noted that elevating the pavilion to a level of 13 or 14 feet above the water line would mean that it would stand five or six taller, looming into neighborhood water views. "It's a beautiful building," Kiley said, "and it was built with the framework of what we had in place." But, he said, it now might make more sense to start over with a flat piece of land. "It's the foundation that's really your cost," said Peter Cummings, one of the engineers on the project. "The building is a sound structure. The real problem is the foundation level." Cummings said there is value in the existing structure. "We don't need people to say, `Rip it down,' because we don't need to," he said. Jose Miguel Albaine, lead engineer on the project, said starting from scratch would also mean including the cost of demolition and hauling away the old pavilion. Albaine said the pavilion -- rebuilt over a two-year period, completed in 2011, at a cost of $5.5 million -- was seriously undermined because Hurricane Sandy's flood waters caused scouring that exposed the structure's footings. In some cases, the flood waters bored under the footings and carried away soil from beneath them. Albaine said he believes the footings were not driven deep enough into the sand and soil to support the pavilion in all kinds of weather. Public Works Director Joseph Michelangelo said officials will meet with the Parks and Recreation Commission to discuss the future of Penfield Pavilion. The selectmen said there should also be meetings with neighbors. Several neighbors attended the selectmen's meeting Wednesday, and asked that town officials keep in mind that whatever they do with the pavilion will have an impact on the neighborhood behind the beach. One neighborhood resident, George McCluskey, suggested the town collect a "nice, big, fat" insurance check for the storm damage, make the pavilion half the size it is now and move it off the beachfront and into the parking lot.